This site is Japanese only. We described the contents of the following in the site. １　About us, we are ＦＰＡＰ, Nonprofit Organization support regional performing arts at Fukuoka, Kyushu. 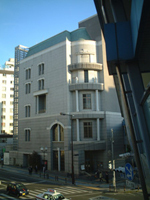 ２　About POMPLAZA-hall, the almost regional performing arts groups at Fukuoka use here. We are a Nonprofit Organization founded to support the regional performing arts in Fukuoka and Kyushu. In October 2003, this organization was founded by theatrical in Fukuoka. POMPLAZA-hall is the theatre, has the 108 sets. POMPLAZA is located in the central principle of Fukuoka city. This theatre has very good access. POMPLAZA is often used for regional performing arts groups. POMPLAZA-hall is a low rate compared to other theatres. ●If you want see our theatre, we are welcome. Please mailto us, before your visit. At POMPLAZA-hall, theatre performances are held in almost all Japanese. When watching a play, please consult us in advance. Try to request a translation of the summary to the group performances. We can speak English a little. When you visit, please contact us in advance. We will schedule as possible. There is Fukuoka International Association, that serve " Language volunteer". You could ask for an interpreter, if the international exchange and international understanding of the non-profit. Copyright© ＦＰＡＰ All rights reserved.